As of yesterday, Cobalt and I have been on our way to California! 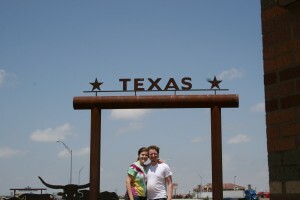 It’s already been such an adventure so far, as neither of us have been on a legit road-trip before. We left around 8am yester-morning, Cobalt starting off our trip, taking the scenic route to I-40 (it was supposed to be quicker both in time and mileage). On the way we ran into speed traps galore, saw a man costumed up in his speed racer, drove through Amish country and saw two Luddites driving carriages, and saw a heck of a lot of corn fields. We ate a cheeseburger and fries at the Iron Skillet (after Memphis) for lunch, then I took over the wheel and drove to Oklahoma City, where we spent the night. Before crossing the state line though, we ate the most delicious Cuban food in Fort Smith, Arkansas. 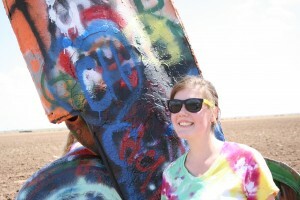 Today we drove from Oklahoma to Albuquerque, New Mexico. To our delight, there were many more places to stop. 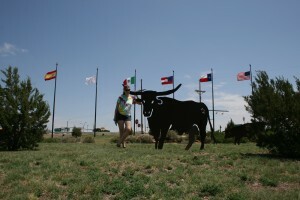 After quickly eating a breakfast of cereal, danishes and a homemade London fog (for me) at our hotel, we drove about five hours to lunch at the Big Texan Steakhouse in Amarillo, Texas. Not 10 minutes before so, we briefly browsed the Texas visitor’s center to gather information for the miles ahead. The greeter was very kind and informative for what places to see and how to get there; he gave us maps, brochures and even two boot pins (because we didn’t have any Texas boots!). Though the cotton candy blue and yellow colored building was a bit on the cheesy side, I agree with Cobalt that the atmospheric cowgirl/cowboy hat, boots, spurs, and sheriff star pins of the Big Texan Steakhouse are “iconically” Texan. At the restaurant, we ordered a Buffalo Burger with a loaded baked potato on the side. We were thrilled to find a huge jalapeno next to the sandwich — which we proceeded to chop up for each bite — and that the potato came not only with bacon bits and cheddar cheese, but also bacon sour cream! 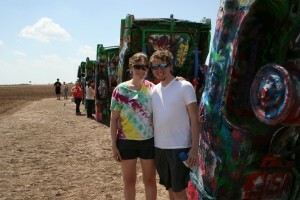 Next was the Cadillac Ranch, a more fascinating and popular place than we were expecting. 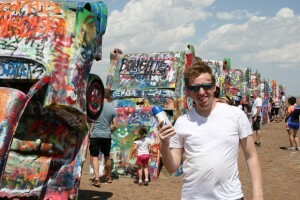 The greeter at the Texas visitor’s center had informed us that bringing spray paint cans is encouraged, as this site is a “continual work of art.” Excited, we stopped by Walmart on the way. While approaching the rustic Stonehenge, we were surprised how many cars were lined up on the side of the road to observe and contribute to exhibit. 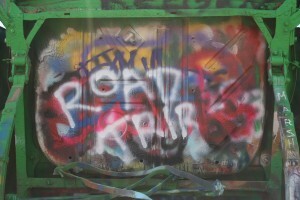 We stayed about 30 minutes to paint, take pictures and observe the other visitors. 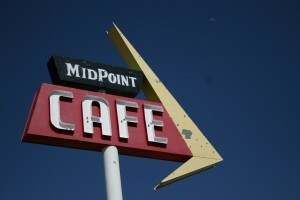 Our last stop was the Midtown Café, midway between Chicago and Los Angeles on Route 66. Though we had arrived 15 minutes after closing, the owner was kind to let us buy some pie “to go.” Cobalt ordered a pecan piece and I ordered a chocolate peanut butter cream piece. For lack of better description skills, I’ll just say they were delicious!! 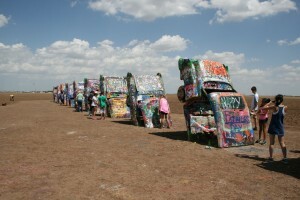 Besides the stops, what kept the drive the most interesting of all was the constantly changing landscape. 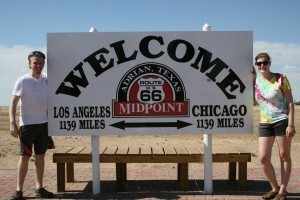 It was super flat in OK but gradually got more hilly, especially near the end of the Texas panhandle. What began showing up was shallow canyons, red dirt and ever short bush-trees than OK. Unfortunately, our lack of updates have been due to the car charger not working (apparently the cigarette lighter doesn’t work?). Hence, we are only able to update at night/early morning when we are in WiFi because Cobalt’s iPhone’s battery only lasts so long. Occasionally I post from Facebook on my flip phone (I text my status) but for some reason Facebook hides those posts until I log on and change their visibility from “private” to “friends.” So that’s our explanation but we hope you’ve enjoyed this first update!